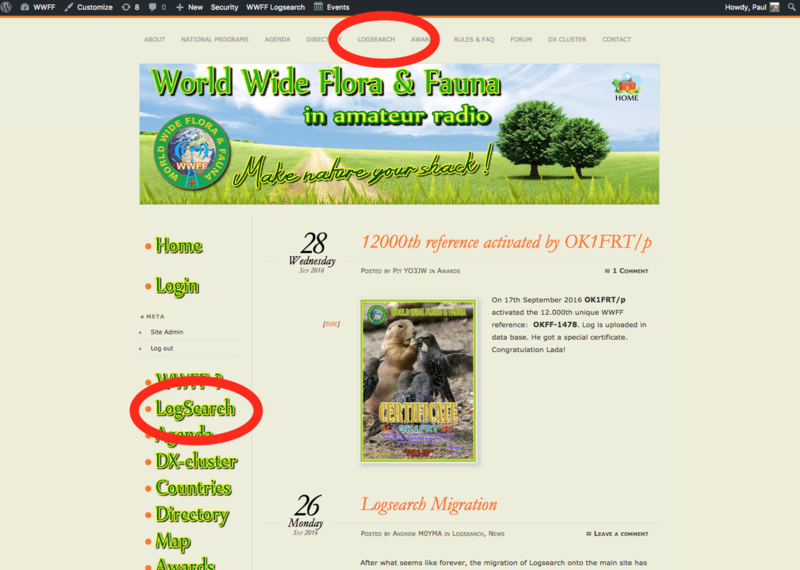 Logsearch is the electronic database for the World Wide Flora Fauna (WWFF) program. Activator logs are uploaded to Logsearch by National co-ordinators. ​Through Logsearch, WWFF Activators and Hunters can easily view their progress in the WWFF program, and apply for awards on-line. How do I access Logsearch? You first need to register to be able to use Logsearch. From the wwff.co home page, click on 'Register'. This will take you to the page show below. Enter your user name (Please use your call sign as your User name), your email address, and your first name. An email will subsequently be forwarded to you, confirming your registration. 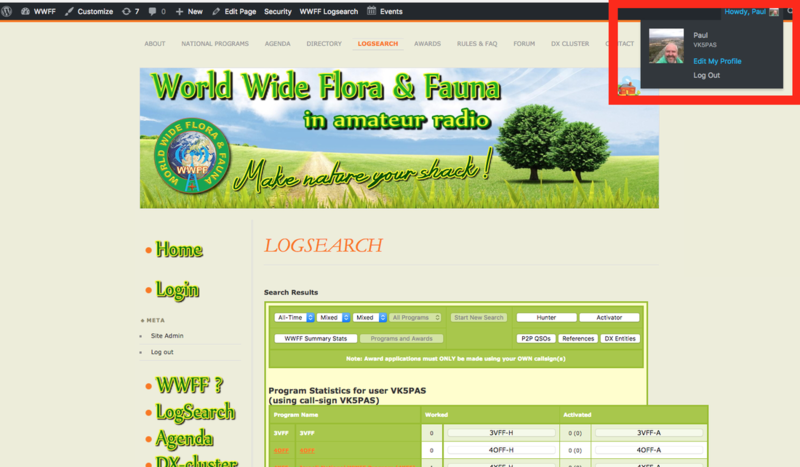 Once registered, you can access Logsearch from the main wwff.co page. Either by clicking on 'Logsearch' in the top toolbar, or by clicking on 'Logsearch' in the side toolbar. Why are activator logs sent to the National co-ordinator? Why can't I upload my own log? Unlike SOTA, where activators and chasers are required to data enter their logs or contacts into the SOTA database, WWFF activators provide their logs to the relevant National co-ordinator, who in turn uploads the activator log. 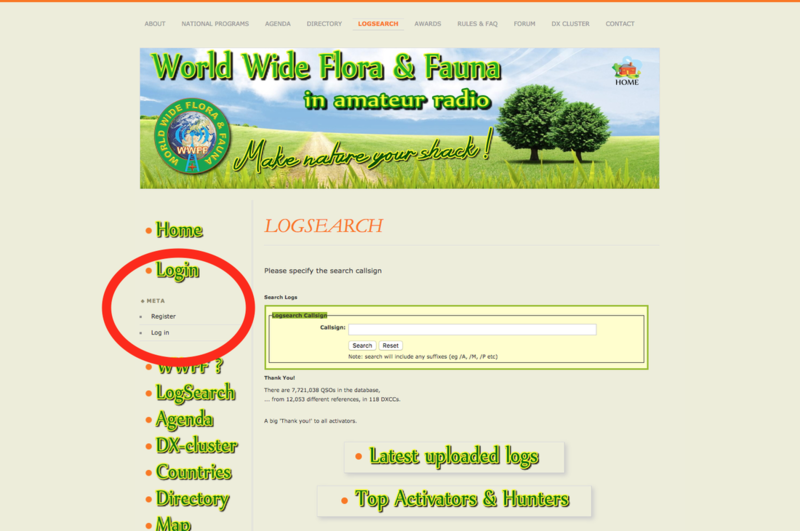 WWFF Hunters do not have to provide any logs and are not required to have any contacts uploaded. What if there is an error in your activator log? If any errors are detected in the file after processing, the co-ordinator will receive a report showing the errors (see screen shot below). The activator will subsequently receive an email from the co-ordinator, requesting that the errors be fixed and a new log provided. Why are the figures in the 'QSO's and 'Hunters' columns RED? And why is there a RED CROSS in the 'Valid' column? Don't worry. This is normal. The red figures and the red cross indicate that you have not yet reached the required threshold of 44 QSOs for the global WWFF program. The Log Search system still recognises these QSOs towards your VKFF awards. The figures will become black and you will see a green tick in the 'Valid' column once you have attained 44 QSOs. I want to add another callsign to my profile. Can I do this? Yes, you can add call signs to your profile by clicking on 'Edit Profile' in the top right hand corner, and then adding the call in the callsigns section of the 'Information' box. Please ensure that you use a comma to separate the calls. What if I upgrade my call and I want to start fresh hunting parks? If you have updated your callsign and would like to start fresh again hunting parks with your new call sign......simply send an email to Paul VK5PAS, who in turn will email the Log Search administrator in the UK, Andrew M0YMA. Andrew will update your User name to your current call sign. 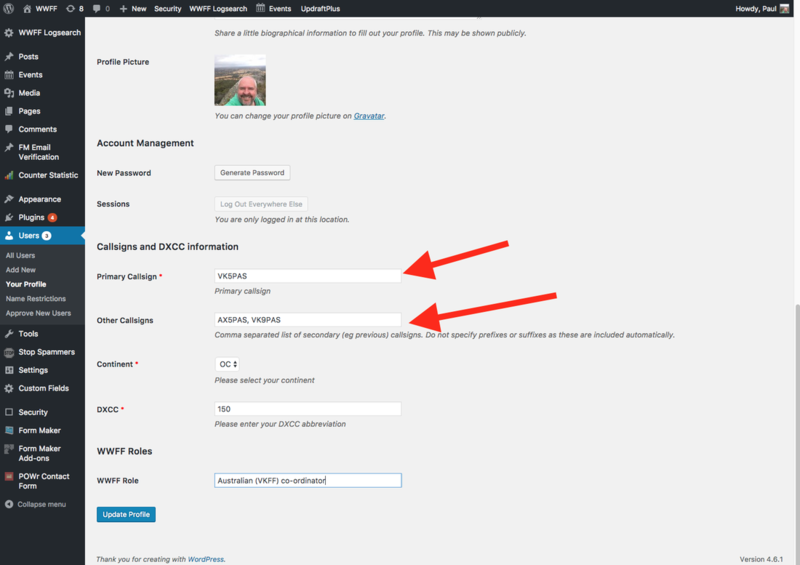 Although you can edit certain information in Log Search, you are unable to change your User name. Please do not send emails direct to Andrew. In the first instance, please send an email to VK5PAS.